Patra's Other Place: Ken's first (and last) flying lesson. One of the more unusual gifts Ken received for his 70th birthday last December was a gift voucher for a simulator flying lesson. It is incredible what you can do these days with 'experience' gift vouchers. I've had a hot air balloon flight, Ken had a flight in a Tiger Moth aircraft, I gave my late stepmother a flight in a helicopter....and so it goes. I was thinking of giving Ken a voucher for a drive in a Formula One car, which he says he would have loved, but when I looked into the details, not only was it very expensive, I couldn't figure out where he would have to go to do it; I don't think it was at Albert Park anyway. 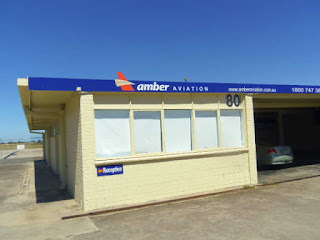 So on Saturday morning we set off for Essendon Airport (which used to be Melbourne's main airport until more and more bigger and bigger planes started flying into Australia and we had to build a much bigger airport at Tullamarine. Essendon is still used, but mostly for training and small aircraft like Cessnas. This little building is where the flight simulator is housed with a small office and kitchen. 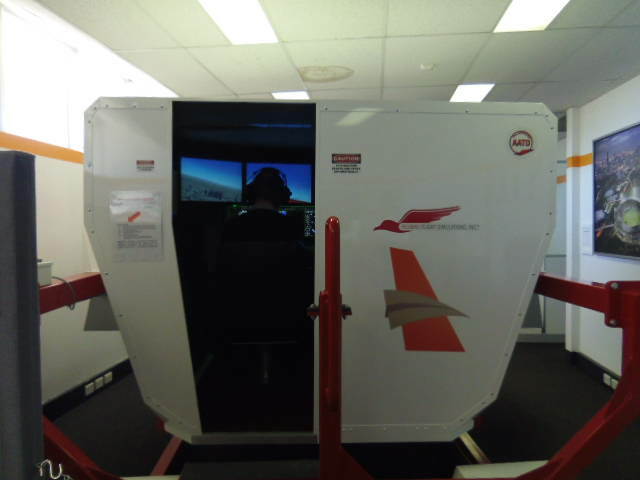 This strange contraption is the simulator. Ken is sitting on the left and the instructor was on his right. All the controls in front of them are the same as in whatever model of plane they were supposed to be flying (not a 747!) and the simulator rocked now and then to imitate turbulence and when they landed and took off. I was able to poke my head in the door and get a few photos. It looks and feels very realistic, according to Ken, who said having done this, he would never think of going for real flying lessons! He nearly 'crashed' their plane, and when he was coming into land, he veered off the runway onto grassland! I couldn't help laughing, but Ken said "It's not funny, Gina!" 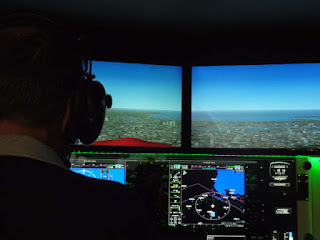 He was quite relieved to get out of the simulator and have a drink of water, but on our way home, he admitted that while it was nerve wracking, it was a fun thing to do. What a wonderful thing to do! I don't think there is anything like this in our area........my husband would love it! I came here after reading your post on you Linen collection blog. So sorry for the pain you are suffering and I hope that you can continue small projects because your work is always so pretty. You asked on my blog about whether I have embroidered the linens you had sent to me. Yes, I have embroidered one and am still in the process with the others. Thank you so much for thinking of me and sending these pretty treasures. Have a good weekend coming up.